It is the science of assessing the horse’s health by analyzing the fiber structure, color and markings of the iris. Equine Iridology is an assessment modality that looks at the body’s constitutional strengths and weaknesses, levels of inflammation and the functioning of the elimination system and organs. Iridology is not a treatment technique or diagnostic tool. It is used as a nutritional guide to help horse’s achieve a higher level of health. The method is safe, painless and non-intrusive. Iridology is not a new science as the Greek physician Hippocrates was thought to have looked into the eyes of his patients to see their illnesses. Iridology was re-discovered in the 1800’s by Ignaz von Peczely, a Hungarian physician. He was caring for an owl that had broken his leg when he noticed a dark spot in the owl’s eye. The owl stayed in his care and as time passed he noticed that the mark began to lighten. In Iridology when we see lightening of a dark mark it is a sign of healing. Ignaz continued to test his theory with other animals and later on he developed one of the first Iridology charts, it is the basis for most Iridology charts today. In the 1950’s Dr. Bernard Jensen, DC, PhD, was instrumental for bringing iridology to the United States. Dr. Jensen is known as the “Father of Iridology.” He developed a grid that mapped out the various organs and tissues but it wasn’t until recently that a specialized chart was developed for horses. After years of practicing Human Iridology I wondered if there was Iridology for horses so I started doing some research. In my research I came across Mercedes Colburn, ND, PhD, of Through the Eye International in California. I was so excited when I found her site, I immediately sent her an email. Mercedes returned my email in a couple of days and wanted to setup a time for us to talk. This was so exciting. After talking to her I found out that she offered a course where I could become certified in Equine Iridology and yes you guessed it, I did just that. During our talk I found out that Mercedes Colburn PhD, N.D and Dr. Dena Eckerdt, DVM developed the equine iridology chart after charting hundreds of horses which took almost 10 years to finalize. After seeing signs of trouble in the eyes they did a follow-up through veterinary exams to validate their findings. 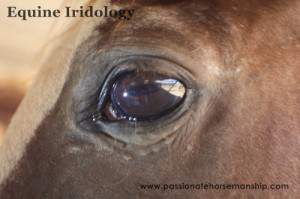 Iridology is of benefit to every horse owner. It can be useful when buying a horse because it can alert the potential owner to current or past health issues or physical problems – such as a horse with back problems that can’t be ridden. For breeding purposes you could have the Sire and Dam assessed for their inherited weaknesses or strengths. Iridology shows changes in the iris before they physically appear. The owner can then take preventative action to help improve the horse’s health and possibly avoid a disease. Interested in having an assessment done on your horse? Call (325-261-3360) or email me for more information.